Mario Aguilar, Marcello Averburg, Hugo Benito, Rolando Castañeda, Juan Luis Colaiacovo, Ruth Connoly, Clara Estrada, Jorge Garcia-Garcia, Emilio Labrada, Orlando Mason, Pedro Turina, Raúl Sanguinetti, Ricardo Zavaleta. (La información que se suministra a continuación proviene principalmente de Wikipedia y de Wine-searcher.com). Cava is a Spanish sparkling wine made in the traditional method of the French sparkling wine Champagne. The definition of Cava is Vino Espumoso de Calidad Producido en una Región Determinada (VECPRD). It originated in the Catalonia region at the Codorníu Winery in the late 19th century. The wine was originally known as Champaña until Spanish producers officially adopted the term “Cava” (cellar) in 1970 in reference to the underground cellars in which the wines ferment and age in the bottle. The early Cava industry was nurtured by the phylloxera epidemic of the late 19th century, which caused the destruction and uprooting of vineyards planted with red grape varieties. Inspired by the success of Champagne, Codorníu and others encouraged vineyard owners to replant with white grape varieties like Macabeo, Parellada and Xarel·lo to use for sparkling wine production. These grapes are still the primary grapes of Cava today though some producers are experimenting with the use of the Champagne wine grapes of Chardonnay and Pinot noir. For most of its existence, the production of Cava was not regulated to a particular region of DO but rather to the grapes and method of production. Upon Spain’s acceptance into the European Union in 1986, efforts were undertaken to designate specific areas for Cava production. Today use of the term “Cava” is restricted to production around select municipalities in Catalonia, Aragon, Castile and León, Valencia, Extremadura, Navarra, Basque Country and Rioja. Around 95% of Spain’s total Cava production is from Catalonia, with the village of Sant Sadurní d’Anoia being home to many of Spain’s largest production houses. Bullas is a DO (Denominación de Origen) wine region in the southern part of the Murcia province in south-eastern Spain. This location makes Bullas the southernmost DO wine zone in the Levante (the traditional, collective name for Murcia its northern neighbor, Valencia).The Bullas DO title was created in 1994, and is managed by its own Consejo Regulador (wine authority). It’s named for the small, ancient town of that name, located at the heart of official Bullas viticultural area. Although the area only gained n official DO title relatively recently, it has a long history of winemaking. It is best-known for its rosé and red wines, particularly those made in the fresh, vibrant joven style. Bullas has a similar climate to Murcia’s other wine regions, with the Mediterranean effects marginalized by the hot, dry conditions of the central Iberian plateau. Summer days tend to be very hot, with temperatures regularly rising to 104°F (40°C). Higher-altitude vineyards in the region’s hilly north-west are noticeably cooler, and it is here that grapes are grown for the majority of Bullas wines. Winters all over Bullas tend to be cooler than in other parts of Murcia, because of the mountain influences, which means that occasional frosts are a threat. Most vineyards sit between 1,650ft and 2,700ft (approx 500-810m) above sea level. The soils here are often so hard they have to be broken up by mechanical means before vines can be planted. This effort is well rewarded, with limestone and chalk soils providing good drainage in the higher areas and alluvial and limestone soils in lower-lying parts also offering good drainage. This is essential, as torrential rains and storms can hit Bullas in September and October. Monastrell reigns supreme in Bullas and is responsible for the DO’s signature fruity red wines. It accounts for 60% of the vines here. Traditionally, most of these were drunk joven (young), but since Bullas attained its appellation status, many adventurous producers have successfully experimented with maturing the best wines in American oak barrels. Monastrell is known under several names. Monastrell is used in Spain and Mourvèdre is the name used in France, where it is also known as Etrangle-Chien. There are 95 other names, including Mataró, which is used in Portugal and parts of the New World. Mourvèdre (as it appears in Wikipedia) is a red wine grape variety that is grown in many regions around the world including the Rhône and Provence regions of France, the Valencia and Jumilla denominación de origens of Spain, California and Washington State and the Australian regions of South Australia and New South Wales. In addition to making red varietal wines, Mourvèdre is a prominent component in “GSM” (Grenache, Syrah, and Mourvedre) blends. The variety is also used to make rosé and port-style fortified wines. Mourvèdre tends to produce tannic wines that can be high in alcohol. The style of wine produced from the grapes varies greatly according to where it is produced, but according to wine expert Jancis Robinson Mourvèdre wines often have wild game and/or earthy notes to them, with soft red fruit flavors. Most wine historians agree that Mourvèdre is likely Spanish in origin though its exact history is difficult to pinpoint. The variety was probably introduced to Catalonia by the Phoenicians around 500 BC. The French-adapted name Mourvèdre likely came from Murviedro (Mourvèdre in Catalan, nowadays Sagunt) near Valencia while the Spanish name Mataró likely came from Mataró, Cataluña near the modern-day city of Barcelona. Despite this close association with Murviedro and Mataró, the grape became known in Spain as Monastrell for reasons that are still unknown. While it likely arrived earlier, Mourvèdre had a well-established presence in Roussillon region of France by at least the 16th century where it spread eastwards towards Provence and the Rhone. There it had a well-established foothold until the phylloxera epidemic of the mid to late 19th century decimated plantings. Mourvèdre arrived in California in the 1860s as part of the Pellier collection. The variety, known as Mataro, was used primarily for bulk produced jug wines. In the 1990s, critically acclaimed bottlings from Bonny Doon Vineyard and Cline Cellars Winery promoted increase demand in the variety and by the mid-2000s, plantings of Mourvèdre in California had risen to 260 ha (650 acres). In Australia, the variety (known there as Mataro) has had a long history in the country with plantings dating back to the mid-19th century. While historically the variety was used mainly as an anonymous blending grape in fortified wines, the variety saw a rise in interest in the 1990s as producers started receiving acclaim for GSM (Grenache, Syrah, and Mourvedre) blends (many from the surviving, low yield old vine plantings). According to ampelographer Pierre Galet Mourvèdre thrives in warm climates as the variety has a tendency to both bud and ripen very late. While the variety can recover well from late spring frost due to the late budding, it is can be very temperature sensitive throughout its growing season with even low winter temperatures affecting its dormancy. Though the grape can adapt to a variety of vineyard soil types, the most ideal sites are very warm, south facing (Northern hemisphere) slopes with shallow, clay soils that can retain the necessary moisture to keep the vines “feet” wet without letting it grow its foliage too vigorously. In addition to a warm climate, Mourvèdre also does best in a dry climate with sufficient wind to protect it from the viticultural hazards of powdery mildew and downy mildew. The harvest window for the grape tends to be very short once it reaches peak ripeness, with acidity rapidly fallen and the grapes soon desiccating and developing “prune-y” flavors. One advantage of the thick skins is that Mourvèdre can withstand late harvest rains without the berries swelling and bursting like thinner skin varieties such as Grenache. In Spain, Mourvèdre (where the grape is known as Monastrell) was the fourth most widely planted red wine grape variety at the turn of the 21st century with around 63,000 hectares (155,000 acres) in 2004. Like many other Spanish varieties, its numbers have been declining in recent years (in 1996 there was over 100,000 ha/250,000 of the vine planted in Spain) as growers pull up older plantings and replant them with popular international varieties such as Cabernet Sauvignon and Chardonnay. Growing Mourvedre is not recommended for vignerons without a great deal of patience. The vines take several years before they begin to produce fruit of any quality – sometimes five years can pass before a Mourvedre vine yields its first harvest. The variety is also a late ripener, one of the very last to be picked. In the coastal hills of Provence (particularly around Bandol), Mourvedre is deliberately planted on warmer, south-facing slopes to speed up the ripening process, while Syrah and Grenache are planted on cooler, north-facing slopes. Food Matches. Europe: Rabo de toro (ox tail); gigot à la ficelle (wood-fired leg of lamb on a string) Americas: Pastel de papas (Chilean beef casserole)Australasia/Oceania: Milk-fed veal with baba ghanoushAfrica/Middle East: Khoudar mahshi bil forn (lamb-stuffed baked vegetables). The Garnacha y Cariñena (Carignan) Varieties . Garnacha, also known as Grenache, is a red-wine grape grown extensively in France, Spain, Australia and the United States. It is a particularly versatile both in the vineyard and the winery, which may explain why it is one of the most widely distributed grapes in the world. Grenache is the French (and most internationally recognized) name for the grape, but it has a number of synonyms. In Spain, where it is grown extensively, it is known as Garnacha, and on the island of Sardinia it has been known for centuries as Cannonau. Some believe that the grape originated in Sardinia, and was taken back to Spain by the Aragonese, who occupied the island in the 14th Century. In Spain, Garnacha is the second most planted red wine grape variety. It is outplanted only by its modern blending partner, Tempranillo. In the 1980s and 1990s, Grenache’s status was reduced, but it survived efforts to eradicate it, returning to international favor in the 21st Century. It is grown in almost every area of Spain, but most notably in the north and east. The arrival of the grapevine pest phylloxera to the Iberian Peninsula, in the 19th Century, brought unexpected benefits to Garnacha; as the native vines were devastated (Rioja was particularly badly affected) it was robust Garnacha that replenished the vineyards and helped to re-energize the wine industry. Grenache berries have thin skin and ripen late in the growing season. Acid and tannins can be variable depending on growing conditions and cropping levels, but tend towards the low-medium end of the spectrum. However, old-vine Grenache grown in schist or stone, such as in Priorat and Chateauneuf-du-Pape, can produce profoundly concentrated wines capable of aging over many decades. Produced as varietal wine, Grenache exhibits rich, spicy, berry flavors, particularly raspberry. Cariñena, also known as Carignan, Mazuelo, Bovale Grande, , Samsó, and Carignane is a red Spanish/French wine grape variety widely planted throughout the western Mediterranean and around the globe. Along with Aramon, it was once considered one of the main grapes responsible for France’s wine lake and was a substantial producer in jug wine production in California’s Central Valley. Ampelographers believe that the grape likely originated in Cariñena, Aragón, and was later transplanted to Sardinia, elsewhere in Italy, France, Algeria, and much of the New World. Carignan was likely introduced to Sardinia sometime between 1323-1720 when the island was under the influence of the Crown of Aragon; here the grape developed in isolation to form distinct clones under the synonyms Bovale di Spagna and Bovale Grande. The varietal was historically a component of Rioja‘s red wine blend. From Spain, it gained prominence in Algeria and fed that country’s export production to France. The popularity of Carignan was largely tied to its ability to produce very large yields in the range of 200 hl/ha (11 tons/acre). In winemaking, the grape is often used as a deep coloring component in blends, rather than being made in a varietal form with some exceptions. Carignan can be a difficult variety for winemakers to work with being naturally high in acidity, tannins and astringency which requires a lot of skill to produce a wine of finesse and elegance. Syrah and Grenache are considered its best blending partners being capable of performing a softer wine with rustic fruit and perfume. Vines were first introduced to the area by the Romans thousands of years ago, and Catholic monks continued the viticultural tradition during the Middle Ages. By the 19th Century, wines from Montsant were receiving praise at universal exhibitions. Montsant is a wine region in Catalonia, northern Spain. The gently undulating area was formerly categorized as a viticultural sub-zone of Tarragona, but local growers felt the high-altitude vineyards here earned the region recognition as a DO in their own right. As a result, the Montsant DO was created in 2001, its name taken from the Montsant massif (‘holy mountain’) that dominates the region’s landscape. Montsant lies west of Tarragona city and forms a ‘C’ shape that almost completely surrounds the prestigious Priorat region. The vineyards extend along the mountainsides among olive groves, forests and rocky outcrops. The denomination covers the area of Priorat comarca that is not part of DOQ Priorat as well as part of the neighboring comarca of Ribera d’Ebre. In total, 17 villages are included. Montsant has earned a reputation for its high-quality red wines, particularly those based on old Garnacha and Cariñena (Carignan) vines. Ull de Llebre (Tempranillo), Spain’s darling, and international varieties such as Cabernet Sauvignon, Merlot and Syrah also perform very well here. Most red wines are typically intended for aging and exhibit velvety textures even after a short time in oak. The old vines offer particularly complex examples. Praise for Montsant’s high-quality wines is getting louder as the international market realizes the region’s potential. El primer vino, Blanco fue calificado como Muy Bueno con Average de 87 puntos; el primer tinto, como muy Bueno con una Media de 88 puntos y el segundo (tinto) ultimo vino, tambien como Muy Bueno con una calificacion media de 89 puntos. En resumen todos fueron calificados de Muy Buenos. 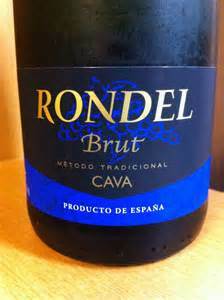 2008 Rondel Cava – Tesoro de Bullas, Seleccion. Bodegas del Rosario Bullas, Murcia. Impresion General: Es un Blend muy bien calificado cuya mezcla de las sepas: Macabeo, Xarello y Parellada, resulta un producto muy elegante en su aroma, sabor y frescura. Es un vino blanco seco de un sabor afrutado y un agradable final. Muy bien balanceado. 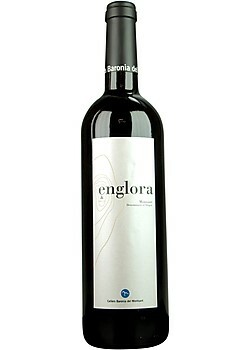 2008 Englora Rojo – Baronia del Montsant Englora, Tarragona. Impresion General: Excelente vino, las sepas para la elaboracion de este son de mucha edad asi: 70 anos de vejez para la Garnacha, 50 anos para la Carignen y cerca de 25 anos para las otras variedades, que componen este blend. Hay muchas caracteristicas buenas resultantes de esta combinacion de un color rojo violeta, excelente aroma y final largo. Aroma agradable afrutado y especies, que detallan una agradable sensacion. 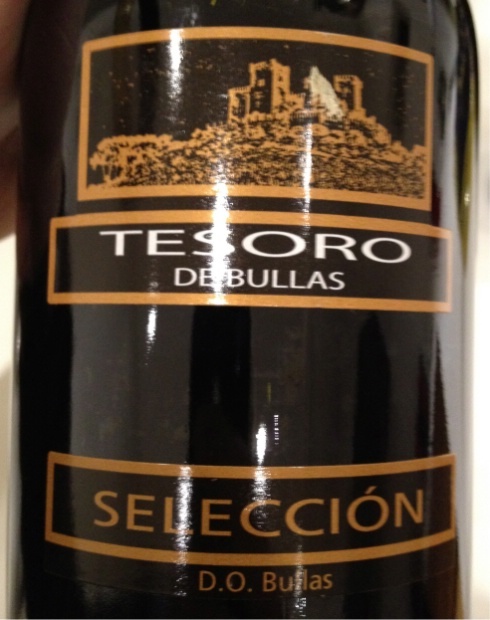 2008 Tesoro de Bullas – Seleccion Bodegas del Rosario, Bullas, Murcia. Impresion General: Gran impresion, es un vino muy acceptable, con un color rojo oscuro, elaborado con uvas selectas que son: Monastrell (Mourvedre) y Syrah. Los suelos de sus plantaciones son muy duros y hay que usar maquinaria para plantar las vides, son madurados en barricas de Madera de roble. Bastante bien balanceado excelente sabor con un final fuerte y agradable al paladar. El Mejor Vino: Tesoro de Bullas – Selección Bodegas del Rosario – 2008 Murcia. This entry was posted in Meeting Abstract and tagged Cava, Spain. Bookmark the permalink.